About 10 years ago, I was heading back to DC from Alabama and I got stopped for speeding. This would not be that unusual. There would, however, be one thing to take into consideration. I never came back from Alabama without a food-laden car. It was as if there were no grocery stores in DC. The policeman, simply didn't understand why I had 10 bags of White Lily Flour in my car. He assumed the worst. But after digging through the corn meal and the grits and cases of Tab, he sent me on my way with a mere warning. A week or so later, a chef friend was in my kitchen surveying the bags of White Lily and asked, nonchalantly, if I might be opening a bakery. 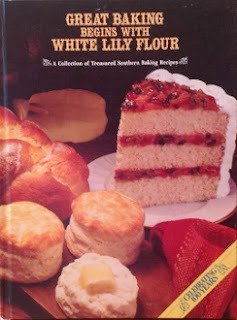 Well, if I was to open a bakery, I would use nothing but White Lily Flour. Of course, nowadays, White Lily Flour is produced in some Yankee wasteland. I recently found an authentic bag of White Lily, milled in Knoxville. It was about 6 years old, so I am not sure its Southern mojo was still intact, but I couldn't bear to toss out that bag. Over the years, White Lily has put out several cookbooks. Great Baking Begins With White Lily Flour is my favorite. white Lily gets its prized baking characteristics from a soft, red wheat. The flour is milled from only 100% pure winter wheat. This soft winter wheat has a lower level of protein as well as a lower gluten content. To accentuate the baking quality, White Lily uses a finer grind than most flours. White Lily was always east to spot because the bags were a pinch larger due to the fine grind which made the flour weigh lass, so more was needed to make a full five pounds. For White Lily, great baking requires specific attention to detail. Here is the White Lily recipe for biscuits, with all the notations one would have learned at Mama's knee, spelled out. Preheat oven to 500 degrees. Place Flour in mixing bowl; ad shortening. With a pastry blender or blending fork, cut shortening into flour until mixture resembles coarse crumbs. Mixing by hand tends to soften the shortening making a sticky, difficult-to-handle dough. Blending the fat completely with the flour or using a liquid shortening produces a mealy biscuit rather than a flaky, tender one. Gently push the flour mixture to the edges of the bowl, making a well int he center. Blend in the milk with a fork till dough leaves sides of bowl. Too much milk makes the dough too sticky to handle: not enough milk makes the biscuits dry. Do not overmix. That is how you bake biscuits. Now go forth and get those biscuits in the oven.